Shed antler hunting is as intoxicating to me as estrus is to a rutting bull elk. At the moment I didn’t have time to think about the addiction, future hunts for owners of the found antlers or decorative antler ambiance. I was focused on staying upright and for some reason the song lyrics “slip sliding away” popped into my head as I delicately inched my way down a vertical, ice-covered chute. Earlier I made my way up the chute with some clamoring difficulty, but now loaded down with elk antler weight bearing down on my knees the descent had become treacherous at best. Once safely off the ice I still had to navigate a series of rock ledges and hopscotch down to my four wheeler waiting miles below in the sagebrush. Although I had about as much weight as my joints could stand, my antler addiction spurred me to grab several more muley sheds on the way down as darkness halted my hunt. By the time I reached my four-wheeler I was as physically exhausted as from any elk hunt where a weapon played the major role. Looking for shed elk antlers is a surefire way to enjoy Western topography up close and personal. In addition to picking up some bone and gazing at scenery most only dream about, shed elk antler hunting also gives you a jumpstart on scouting a particular unit. Sure elk oftentimes migrate miles to winter, but they leave clues along the way and oftentimes migratory elk are closer to their homelands than you think. Finally, you may even make a buck if you market the antlers. I hunt sheds for fun and hunting information. It delivers clues on the density of mature bulls in an area both via shed antlers and visually seeing elk as you hike. Plus, as you put on miles you’ll be witness to rubs and wallows from previous years indicating that elk may well be rutting at lower and mid-altitude ranges in addition to commonplace cool, alpine retreats. Last spring I happened across a hidden rutting zone I would never known existed had I not been out on the hunt for sheds. Most of the elk in this particular region spend summer and fall above 9,000 feet, but by pushing beyond a traditional wintering zone I ascended to a hidden shelf a mile or so long by a half mile wide. It was characterized by dark timber and small springs, many turned into makeshift wallows. Rubs were everywhere and I also found a handful of shed antlers. The zone offered both fall seclusion, but also winter escape. I noted it on my GPS for a future hunt and dropped off the mountain before dark. In some Western zones elk spend their entire life in a nonmigratory zone where snow doesn’t hinder survival. If you shed hunt these areas be on the lookout for similar sign as the whitetail hunter. Keep an eye out for elk wallows dished out more than those found in a farmer’s muddy hog pen. Bulls and bucks alike leave rubs around food or dense bedding cover indicating a high rate of occupation. You may also stumble across the carcasses of unfortunate big game giving you solid information on what animal densities to expect in the fall. All of this is verification where you’ll find success in the fall in addition to grabbing a shed antler or two. You don’t have to take rock climbing lessons or purchase crampons to find elk sheds although I oftentimes think it would be worth the knowledge and investment. 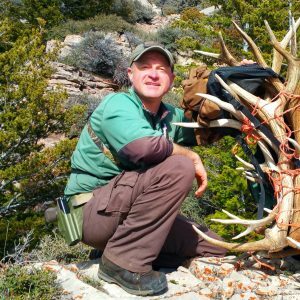 One of the easiest ways to get into shed elk antlers quickly and conveniently is to research state game and fish department websites for elk wintering grounds. Many of these areas have been allotted refuge status with no access until spring arrives. Most have a posted opening date and locals, plus a few travelers line up at the gate to reserve a spot for a run at the antlers. It pays to scout ahead of time and note where bull elk have been biding their time prior to dropping antlers (which generally occurs in late March through mid-April). It also pays to know the rules whether ATVs are allowed or if the area has “walk-in” status only. You’ll find these refuges in most Western states and in areas with large grassy slopes. Elk, muleys, pronghorn and whitetails crowd many areas, but keep your eyes open for bears and mountain lions as well since they follow the food source of congregating wildlife. I generally plan a couple of easy elk antler outings each spring mainly as a social outing with family and friends. By and large most of antler outings take on the look of a Mount Everest expedition minus the oxygen tanks. Mature bulls are like mature whitetails. They tend to avoid the herd, look for out-of-the-way locations to winter and will disappear in a veil of snow if disturbed. Knowing this I look for steep canyons with no motorized access and little in the way of hiking access. Most of these locations have near-vertical slopes, rock-strewn terrain and grazing that requires multi-level maneuvering to fill a hungry elk belly. I characterize many of the areas I target for elk sheds as sheep country. A few even offer glimpses of sheep from time to time. The bulls meander out onto narrow ledges to soak up sunshine, graze for nutrition and look for danger. Elevation differs on where elk winter depending on the climate and latitude, but 6,000 feet seems to be a fair range in many areas. As a side note, if you enjoy picking up any shed antlers as I do, keep a watch out for muley sheds. They’re usually one level below where the majority of elk winter. To find elk sheds you have to find elk. Tap into the resource of local biologists who know the traditional pathways of migrating big game. They can offer helpful insight when you’re trying to locate masses of wintering elk and where you might encounter them during hunting season. Next, make sure you’re in shape. My average day is a 12-mile roundtrip of which half is straight up and most is side-slope hiking. Sturdy, leather hiking boots and one or two hiking staffs is a must. I trust my Cabela’s Meindl Perfekt boot. You must also have a durable and comfortable pack and look to Cabela’s for help in that department too. My best advice is to spend wisely on good optics. You can find many antlers by looking down slopes or across canyons. Focus on white objects looking for partial tips or beams protruding from brush or grass. My favorite optic to carry is a Sig Sauer Zulu binocular model with enough power to pick apart the landscape when looking for bones. Finally, always leave word of where you are going and when you’ll be back. Elk country is big and unforgiving. Don’t expect rescuers to find you like they could on your back forty whitetail honey hole. 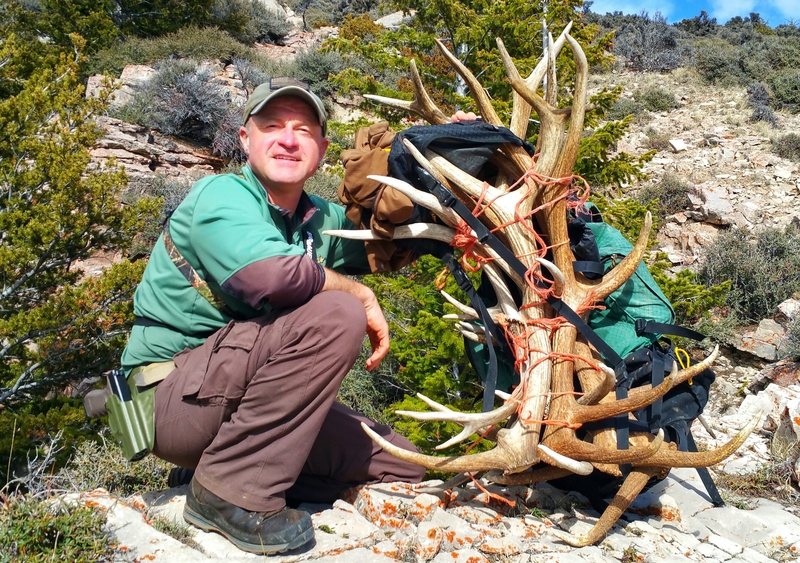 Shed antler hunting doesn’t include the reward of adrenaline, but it does offer the reward of an antler trophy and insight for your next hunt.